The magical season of spring is upon us and mother nature is celebrating her flowers all over the Northern Hemisphere. In honor of the glorious color green, I am extending my green sale until April 11. Use the new coupon code green when checking out to receive 25% off on my green Lotus flower t-shirts, Kimono wrap, Waterfall vest and Tube scarf. I was in Los Angeles last week and while I was there, I made my pilgrimage to Echo Park Lake to pay homage to the special Lotus flowers that have given and continue to give so much to me. In March, the flowers first leaves appear above the water and then over the course of a couple of days they slowly roll open on the of the waters surface. While they are unfolding they look like little boats on the water. I imagine the boat has travels from the mud to deliver a message from the heavens. When it is ready, it scrolls open on the water announcing the birth of the new flower. I am continuing with this month's "love your selfie" theme and want to share a little about my meditation practice because it has changed my life for the better. It wasn't easy for me when I started. Actually, it felt more like torture but I continued to practice because in between my anxiousness and restlessness I experienced little tiny moments of peace and I wanted to feel more of that. Over time, I learned how to let the restlessness fade away and started to see and feel changes in myself and my life. I noticed I was able to remain calm during life's mini crisis. (Nothing like be able to take a deep breathe instead of reacting). I also became more accepting and forgiving of others and myself and overall kinder and more patient. All of this has made me a happier person. I could write a novel about my journey and maybe one day I will. For now, I just want to share this simple meditation for you to try. Sit comfortably in easy pose with your legs crossed on the floor or in a chair whichever is more comfortable. MUDRA: (Hand position) With the four fingers of the right hand feel the pulse on the left wrist. Place the fingers in a straight line lightly so you can feel the pulse in each fingertip. On each beat of the heart mentally repeat Sat Naam. TIME: Set a timer for 7 minutes and then work it up to 11. If 7 feels impossible start with 3 minutes. COMMENTS: This a good meditation for someone who doesn't know how to meditate. It allows you to control reaction to any situation and can bring sweetness to the most scattered minds. If you live in New York and would like to join one of my meditation classes, I teach every Wednesday at Stein Senior Center on 23rd Street and 3 Ave. (2nd floor) The class is from 1-2 pm. Technically the class is for people 62 and older but I think they will be okay if you drop in for my meditation class. I almost forgot to let you know that there are three new colored Lotus flower cap sleeve shirts on the sale page on my website. Please feel free to comment and share your experience with your meditation practice in the comments on the blog. I would love to read about them. Valentine's Day is around the corner and I thought I would share some of the tools I use that help me connect with self-love. One of the practices I recently incorporated into my daily routine is doing mirror work. I'll admit it was difficult. Over time, it has been a fun intimate way for me to connect with myself each day. "Love is the great miracle cure. Loving ourselves works miracles in our lives." If you haven't already seen this video please take a second and watch it. It is precious. Click on the image and it will take you to her video on You Tube. I promise it will bring a smile to your face. Try approving of yourself and see what happens." Happy New Year + Happy Valentine's day. I have missed keeping in touch with all of you and I am excited to be back. I have lots of good news. To start with I am having a Valentine's day sale. The sale is a 20% discount on all items on my website. Use coupon code vday2015. It is good from February 12 to the 15. So if you want to treat yourselfie to a little Valentine's day gift click here. The other news is that I have several new designs from my 2015 collection that are available and on my website. My new Maxi Waterfall Vest looks great down and can also be tied in front or wrapped around your waist and you can flip the draped panels over your shoulders. I also love the way it looks pinned to the side. Check out the other photos on my website for ideas. This is piece is made of the same Bamboo Cotton Spandex blended fabric that I say feels like "buttah" in my favorite Moss green and black. It also comes in Heather grey in a 95% cotton 5 % spandex blend. They are available here. My love of versatile and useful wardrobe pieces inspired me this year to design a new reversible cowl neck that can be folded to create a number of different looks. Over your shoulders it's a capelet and pulled over the head it can be worn as a hoodie. It can also be folded in half and worn as a tube scarf. It is double layered with black on one side and contrast with one of my rich earth toned colors. It feels cosy and soft and adds a little pizzaz to a simple top or dress. That's the scoop for now. I hope you are all enjoying the cosiness that the cold weather brings. I am trying my best. It's been fun seeing how cute everyone on the streets look all bundled up. I am celebrating Small Business Saturday. Today 20 percent off everything on my website. Use the coupon code jqsbs2014. This picture was taken in Union Square. In the photograph, I am wearing my best selling eggplant cap sleeve t-shirt with my little dog Guru. Guru was with me when I photographed the Lotus flowers in Echo Park in Los Angeles and later sat under my table in Union Square Park in New York while I sold the t-shirts of the flower that we discovered together. Sadly, Guru is no longer with me but she was my rock during those days. It was during that time that I met thousands of people, many of which became my customers. They adored Guru my first jq loves u supporter. I learned that my earlier customers purchased my t-shirts because my design was simple and that my t-shirts are made of soft cotton blends designed for comfort. I decided these two qualities would always be the fundamental elements for all my products. Meeting my customers and sharing conversations with them has also inspired me to design pieces that I think my customers would find practical and help them feel good and express their unique spirit. Visit my newly created jq trend and color inspiration boards on Pinterest! In honor of Thanksgiving, I wanted to share with a fun easy and easy way to uplift your spirit in a matter of seconds. I started doing it with a group of women on line in a yahoo group a couple of years ago. It is called a gratitude list ad everyday we post a list of ten things that we are grateful for and then five things we are excited about. I love the practice because this little tiny list can uplift your spirit in a matter of seconds. Lately I haven’t had time to write my list on line and read everyone else’s lists so I write in my journal before I start my day. I promise you if you find yourself in a funk this this is one of the fastest ways to feel better and shifts your energy in minutes. 3. for my sister Tessie who edits all of my newsletters and helps me with my photo shoots and has created the amazing new jq loves u pinterest boards and for being one of my best friends ever. 10. for my brother Michael who passed before I started my company. He was genius and I admired and loved him very much and have often wished that he could be here to guide me. I am sure his has been responsible for some of the magic that has kept this company alive. and have an amazing Thanksgiving. I just got back from my trip to California. I was focusing on production work for jqlovesu. Gratefully, I managed some time outside the city to go camping in the Sequoia National Park. I had the incredible experience of walking among the world's largest living trees. The General Sherman Sequoia tree is the world's largest living tree and believe it or not it is the same height as the statue of liberty! I love to meditate when I am walking because I notice that I am not always experiencing the moment. My mind is busy and working over time about all the other details. One of my favorite walking meditations is one that I learned from one of my Kundalini yoga teachers. I love it because it can keep you in the present moment. I did this meditation when I was in the park. It helped distract me from what I would naturally do. Otherwise, I would have been worrying about the fabric, the sewing, money and all the other details my mind likes to torture me with when it is idling. I am glad I did. I might not have seen this smiling sleeping rock. I encourage all of you take a few minutes and try this walking meditation. The beautiful trees and leaves will rejuvenate your body, mind and spirit and bring you peace. I have to go Brooklyn on Saturday and just writing this has inspired me to make a point and schedule a walk through Prospect Park before I go to a friend's house. Please feel free share how this meditation made you feel. I am excited to share that I have new colors and designs coming soon. Greeting from Los Angeles where I am here on jq loves u business. Yesterday on my way to downtown LA, I stopped at my old stomping grounds in Echo Park to visit the Lotus flowers. I felt like I was visiting old friends. I took a few pictures of them to show you what they look like this time of year. The most typical photograph of a Lotus flower is when it is in full bloom. The pod in the center of the flower is yellow and it has pinholes where the flower’s nectar is extracted by dragonflies, wasps and other flower-loving insects. After fully blooming, the flowers slowly drop its petals and the yellow pod stands alone. Over time, it turns from yellow to green then fades to brown. While the pod’s color changes, the pinholes that once held its nectar start to open. They expand enough for the seeds to fall through the drooping pod as it turns towards the earth to drops its seeds. The seeds fall to the bottom of the lake’s surface for next year’s blossoms. Sitting in front of the lake admiring these amazing Lotus flowers even after they have expired, I am in awe with Mother Nature. The lotus retreats into the darkness and faces the earth. It releases the rest of its seeds into the water. I never look forward to the transition we have to go through when we adjust to the change of time each year, but the lotus cycle has inspired me to plant new seeds in the dark for next year’s blossoms. I am at the tail end of my best fall season ever. I was awarded a blue ribbon at the Maker’s Faire for being one of the editor’s choices. The following weekend I had my highest day of sales in jq market history at Atlantic Antic in Brooklyn. Thank you Brooklyn, Queens and all of you in my growing jq loves u community. Your enthusiasm and support over these past seven years has given me the courage to take chances and keep trying during the challenging times. This past week, I was informed that the eggplant and lead colored fabric that I use to make the jq loves u infinity shrugs has been discontinued. I am very disappointed. If you have been on the fence about getting your infinity shrug in one of these colors now is the time to buy one. I literally have one eggplant in medium left. I have more in large and small sizes in the lead fabric. New colors will be available and I will let you know as soon as they are available. I will be in Nyack on Sunday, October 12. My booth will be on Broadway just in front of the YMCA. If you are in the New York area and have never been to Nyack I encourage you to check out this gorgeous town. It is especially beautiful this time of year. It is officially fall and I wanted to take a second to remind you to put your shrug in your purse. It really comes in handy when the temperatures change by the hour and you’re not sure what layer to bring along. My favorite way to wear my shrug this time of year is in the “cowl neck” style. It looks great under a loose fitting sweater or a jacket. It really keeps your neck warm. If you need a hoodie it can be wrapped around your neck and the thumbholes provide fingerless gloves. In your Infinity shrug you will look fabulous and feel warm and your purse won't be overstuffed with a sweater or jacket. If you don't have one yet you can get yours here. Thank you everyone for the positive feedback from the last meditation newsletter, it inspired me to share another little meditation. Sit quietly in a comfortable position. Inhale in four parts while counting to yourself one, two, three, four and then when you are full of breath hold it for a second. Exhale in four counts. Push the breath out and start again. Besides calming you down this meditation allows the lungs to extract more oxygen from the air. It Strengthens the lungs breathing muscles. Affects the sympathetic and parasympathetic nervous system. Have a great rest of the week and a great weekend. If you are in NYC this weekend, I will be in Brooklyn at The Atlantic Antic, the coolest street fair in New York. My booth will be somewhere between Smith and Hoyt street. The fruit of silence is prayer. The fruit of prayer is faith. The fruit of faith is love and the fruit of love is silence. When the news channels start to show the horrific footage of September 11, 2001, my heart always fills with sorrow. I imagine you have similar feelings each year so today I want to share a little meditation that I promise will help silent your mind and bring you a little peace. It is simple and was designed for beginners. It can be done sitting in a chair at home, on the subway, or outside on a park bench and you don't have to sit with your legs like a yogi. A comfortable sitting posture is all you need. 1. If this is your first time meditating set a clock for 3 minutes if you are an experienced meditator try 7 or 11 minutes. 2. Find a comfortable place to sit. 3. With the four fingers of the right hand, feel the pulse on the left wrist (It is on the thumb side of your wrist). 4. Lightly close your eyes and focus them between the third eye point. 5. On each heartbeat mentally repeat the words Sat Naam. (Sat Naam means I am truth, truth is my identity). If you find it hard don’t worry. It’s hard for everyone even Tibetan monks who do it everyday have trouble. Just keep focusing and before you know it your timer will go off and you can go back to doing whatever you were doing or thinking about. During meditation every cell in the body is filled with energy, which results in joy and peace and gives you fortitude. When I feel tired and I can’t take a nap I sit for a few minutes and focus on my third eye and my breath. Even after three minutes I feel more refreshed, calm and focused. Meditation lowers blood pressure, decreases tension-related pain like headaches, ulcers, insomnia, muscle and joint problems. I hope you take a few minutes and try this meditation it will make your feel so good. Please feel free to share your comments. Hello and welcome to my new jq loves u blog. So many new things are going on that I can’t wait to share with you. A new jq loves u website is coming soon and new fabric is c for a new dress and shrug. I am so excited. I am also so excited to start blogging and particularly to start with this series about the Lotus flower and I hope you enjoy receiving them. I will be sending a little newsletter to your in box that will let you know to come over to the blog. As many of you know, I am passionate about the Lotus flowers. The series that I worked on when I lived in Echo Park, Los Angeles, changed my life and ultimately is what lead me to start my company. 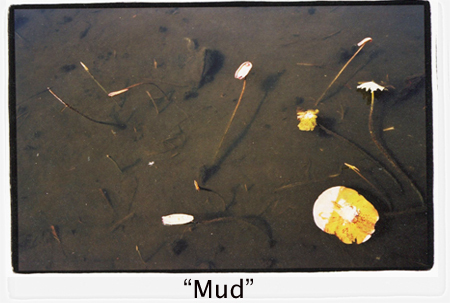 I photographed the flowers that grow in the Lake from the year 2000 until I moved to New York in 2003. Being in the presence of the flowers brought peace and joy back into my heart and I will forever be grateful to them for being my friends and teachers. For the next few months I will be sharing the images I took during that time along with stories and insights I have about the flowers. I hope that you enjoy them. The Lotus flower in Echo Park Lake start to emerge in early March and that is when I would start to visit the lake with my camera. I wanted to be there when the flowers first leaves appeared above the water. I took these images to show what the lake looks like during the winter months. The palm trees reflection on the moving water looked like abstract paintings to me. This is one of my favorite photos. I like it because it shows the infamous mud that all spiritual teachings refer when talking about the Lotus flowers message. What you see here in this picture are the flowers first leaves. They are not the huge leaves that you often see next to the flower blooms. These leaves stay on the water for the flowers entire life. More on this subject in the next post. This past fall, the Vietnamese Zen Buddhist Monk Thich Nhat Hanh came to New York on his world Tour. He created beautiful meditative calligraphies at ABC Carpet that were then exhibited in the store. I bought this card and keep it on my desk.